Bike transportation is booming in Evanston. Not only have the number of bike commuters increased by a staggering 46 percent from 2000 to 2010, but now bike-sharing service Divvy has also recently expanded to the city. From a sustainability standpoint, this rapidly rising number is exciting. But from a safety standpoint, it’s a little nerve-wracking, as more bicycles mean more bicycle accidents. 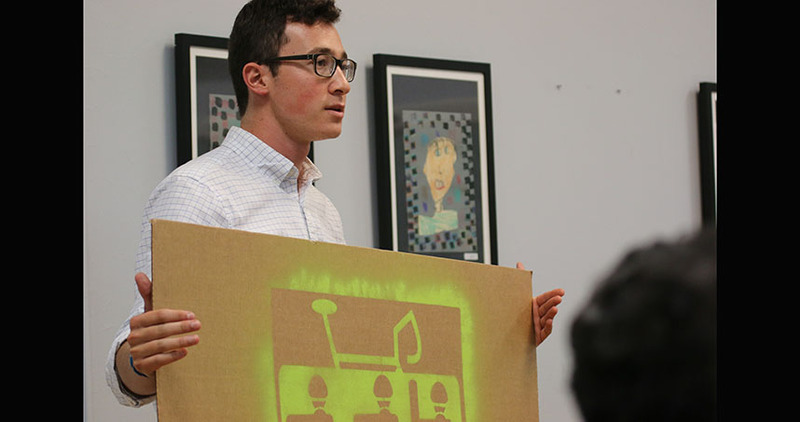 Northwestern Engineering senior Charles Tokowitz has helped the City of Evanston plan for the influx. Two years ago, Tokowitz was a member of a Design for America (DFA) team tasked with using human-centered design to improve cycling safety for cyclists and drivers. His team developed informational road signs that both promote bikers’ use of hand signals and educate all road users on the signals’ meanings. After the DFA team disbanded, Tokowitz continued to work on the signs, eventually introducing them to Evanston officials. A year ago, the city’s Transportation and Parking Committee approved the signs’ installation, which happened in select locations last week as a part of a pilot program. The signs are just one part of the city’s ongoing efforts to make Evanston more bike friendly. 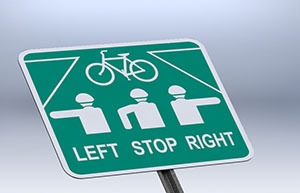 Designed by Tokowitz, the signs communicate the proper hand signals for left turn, right turn, and stop. City staff collected pre-installation data at the selected intersections to measure the use of hand signals by bicyclists. During the pilot phase, staff members will return to the sites to gauge the signs’ safety effectiveness. The data will be reviewed this fall to determine whether or not the signs will become permanent fixtures. When Tokowitz researched the issue, he discovered that only one-third of cyclists are familiar with the hand signals. Of those who are familiar, only two-thirds are likely to use the signals. But Tokowitz, who is an avid cyclist, does not just want to educate and inform cyclists — he wants drivers to take notice, too. Intersections were selected based on a variety of factors, including the amount of bike traffic and number of current signs on display. That way, officials could keep the intersections from becoming too cluttered and confusing. Although signs are a standard practice for communicating to cyclists and drivers, Tokowitz could not find any other examples of how cities use signs to communicate biking hand signals.